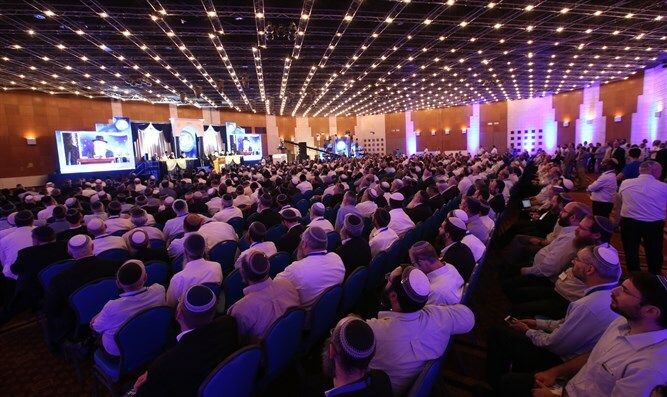 The Religious Zionist Unity Conference took place Thursday evening at Jerusalem's Binyanei Hauma and was attended by More than 1,000 rabbis from across the spectrum of religious Zionism. Organizers reported that the conference was successful beyond their expectations. Rabbi Amichai Eliyahu, Chief Executive of the Association of Community Rabbis, who took responsibility for the organization of the event, said this morning: "We thank G-d for the success of the conference, together in a huge demonstration of unity, together with the great religious Zionists, in recognition of 70 years of the state, the unification of Jerusalem and as a joint preparation for receiving the Torah in a few days as one man with one heart. "Religious Zionism is the influential public in Israel, and the rabbis are the leaders of the public - it was an evening of Kiddush Hashem (sanctification of G-d's name), an evening of Torah honor, an an intense evening which - with G-d's help - will help strengthen the public and together we will continue our blessed work in the glory of Torah," Rabbi Eliyahu added. The conference opened with discussion groups around round tables, in which the rabbis discussed a variety of topics. Later, the rabbis gathered for a special session for thankfulness and unity. They were shown videos and presentations that tell the story of the redemption and rebirth of the State of Israel and the world of Torah, were incorporated with musical pieces. "Maintaining the Sabbath in the public sphere is the most central thing in our identity, which gives expression to the fact that this is a Jewish state. We all need to act and talk about it, in yeshivot and communities. Another common goal is public life, which should be a life of modesty and minimalism. We must act to prevent manifestations of corruption and social gaps. These are the basic and central things around which we must be united, and they will also be heard by the secular public," said Rabbi Stern. Rabbi Zalman Melamed, the president of Beit El institutions and the initiator of the conference, was very excited when he went up to the lectern and recited the Shehecheyanu blessing. "I have been waiting for this great conference for many days. When I see all the important rabbis sitting here together, the heart is full of joy, and the joy is breaking out. I would like to recite the Shehecheyanu blessing. Our rabbis who sit in heaven are certainly happy to see us here," he said. Rabbi Yaakov Ariel, the former rabbi of Ramat Gan, spoke in praise of the great religious development of religious Zionism and its expansion into new fields. "The Torah will not be replaced, and its branches reach all areas of renewed life. On the 70th anniversary of the State of Israel, we observe the amazing development of the State in general and the world of Torah." "The State of Israel is the largest Torah center ever. Within it is a great Torah world of religious Zionism. It has its own contribution to the world of Torah. We have a tremendous variety of institutions and types of Torah study. The emissaries of religious Zionism create a tremendous enrichment of the world of halakha, because it is necessary to provide a solution for everyone," Rabbi Ariel said. Rabbi Shmuel Eliyahu shared the experiences of the holy city of Tzfat last night, in light of the recent attacks by the Israeli air force in Syria and the threat of Iranian missiles in the north: "Early in the morning, all the residents of Tzfat rose from their beds. After that, planes that set out to attack Syria aroused our hearts." "We feel that if we were just full of poetry, we would not have to admit what happened tonight. We do not have time to thank G-d for the wondrous miracles of moving the embassy to Jerusalem, that is the vision of the prophets. We are full of thanks to God for the skill and divine help that revealed the conscience of our enemies, and thanks to them the war has begun against the Iranian nuclear program. We say on this occasion to the Master of the Universe: Thank you, thank you." "We have to understand that we are in the middle of a Divine move," Rabbi Eliyahu added. "Half of the work ahead of him is necessary to bring half of the Jewish people from exile. It is necessary to stir the hearts of the half of Israel that is here, and we are required to continue to lead. Everyone knows that the future is in the hands of the public here, except for us. To lead, we need unity. We must lead on our own, to bring the spirit and faith to continue the path, to know that He who brought us to this point will continue to bring us to the rest of the prophecies very quickly in our time."